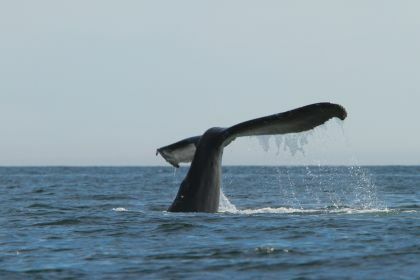 Off the Beaten Path: Sea Otters, Humpback Whales, Debris, and You! We’re located off the beaten path for most things except sea otters, humpback whales, and Japanese tsunami debris – the wild west coast, mighty Pacific, ecology, and you. Between 1969 and 1972, a few sea otters were re-introduced to the Checleset Bay and Kyuquot areas after having been extirpated (locally extinct) for about forty years. 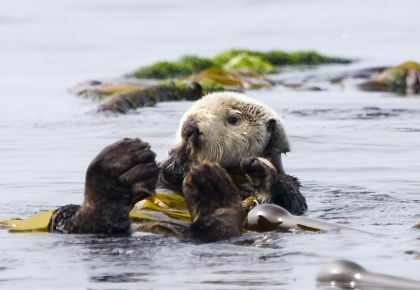 About a decade later, British Columbia designated our province’s largest marine protected area, Checleset Bay Ecological Reserve (34, 650 ha) specifically to safeguard this vital habitat for the sea otters. Now, about 40 years later, the sea otter population in Checleset Bay and Kyuquot remains relatively stable with approximately 1500 otters. As a keystone species, they’ve been re-balancing the local ecology, and have spread northward and southward around both tips of Vancouver Island. West Coast Expeditions started 40 years ago too, but we’ve remained focused on Kyuquot, right in the middle of Canada’s most dense and accessible sea otter population. They’re part of our 'everyday'. For the past decade, the Kyuquot area, along with many parts of the coast have seen a steady increase in humpback whale activity from July to November before they migrate to the Hawaiian Islands. I think that Hawaii has also been seeing a lot more British Columbians doing a similar seasonal migration over the last decade! When sea kayaking in Kyuquot, it’s now ‘not uncommon’ to be treated to the sound, sight, and smell ("whale breath") of a nearby humpback whale or two. We're inclined to follow them...to Hawaii! 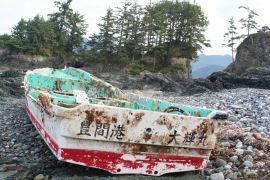 Now, as of July 2012 we also started to see some of the first confirmed Japanese tsunami debris from the devastating earthquake in March 2011. Among the 3 or 4 larger objects (more prone to wind drift) was a small fiberglass fishing boat that came and stayed ashore just around the corner from our sea kayaking camp. The registration number painted on the broken hull was traced to its owner in Fukushima, the site of the nuclear disaster. 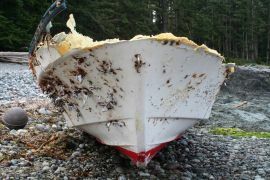 Government officials here tested and confirmed that there were no concerns about radioactive hazards nor invasive species (that grew on the boat while adrift – including some very large and well-travelled pelagic goose barnacles). Our location on Spring Island in the Mission Group of Islands is part of a rugged coastline inside a barrier chain of islets stretching southward from the Brooks Peninsula to Tatchu Point. 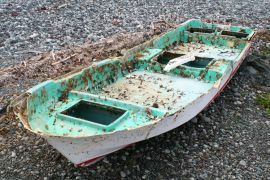 We are ideally situated to catch much of the drifting tsunami debris. Shoreline walks now bring us one step closer to the people of Japan. No matter how we, as a human population, designate areas for protection, track and protect wildlife, or plan for and mitigate our anticipated impacts, we can never truly foretell the implications of natural forces colliding with built and wild spaces. Getting “off the beaten path” while sea kayak touring with us in the remote splendor of Kyuquot paradoxically offers the opportunity to more clearly witness, learn, and reflect about being human within a rich, diverse, and changing ecosystem.